This February marks the 100th anniversary of the founding of ASCAP, the American Society of Composers, Authors & Publishers. Though little known outside the music industry today, its creation set in motion a series of events that still reverberates in the popular music of our time. The epochal Copyright Act of 1909 gave the owners of copyrights in musical compositions the exclusive right of “public performance for profit.” But the practical challenges of enforcing this right against a multitude of performances, each one “fleeting, ephemeral, and fugitive,” were daunting. In Europe, the problem had been solved through the organization of performing rights societies which pooled numerous copyrights, licensed them to performance venues on a blanket basis, and distributed the royalties in proportion to each piece’s popularity, a model that ASCAP borrowed in its 1914 by-laws. 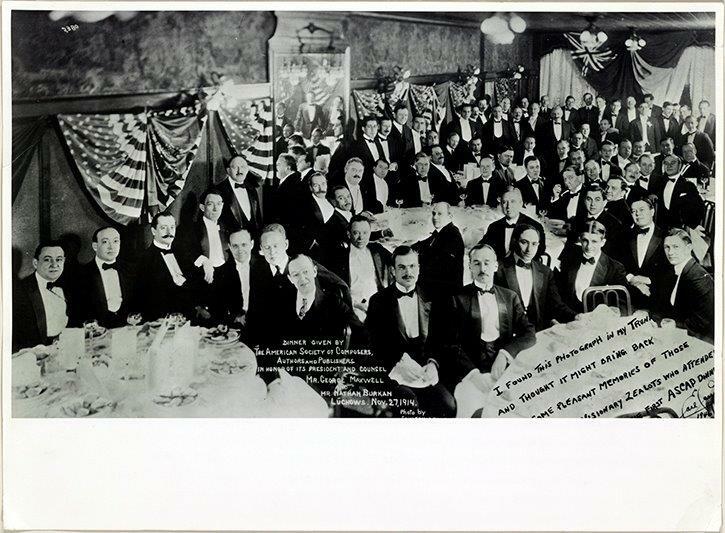 1914 ASCAP Dinner. Image courtesy of the Library of Congress. ASCAP’s efforts to license public performances initially met with massive resistance. But Justice Oliver Wendell Holmes, writing in 1917 for a unanimous Supreme Court, ruled that “public performance for profit” was not limited to concerts or shows where music is the main attraction and admission is charged to hear it, but also includes the even more widespread use of ambient music in commercial establishments such as restaurants and hotels—a ruling that was eventually applied to movie theaters and, most important of all, radio broadcasting. This did not simply raise songwriters’ modest standard of living—it changed the course of popular music. When ASCAP was created, the music business was still dominated by the group of publishers known as Tin Pan Alley. Their profits came from the sale of printed sheet music, and their target consumers were amateur musicians—parlor piano players, barbershop quartets, and the like. They favored simple songs, ones easily learned that required no great skill to perform satisfactorily. “Take Me Out to the Ballgame” of 1908 is perhaps the quintessential Tin Pan Alley tune most frequently heard today. Publishers were long in the habit of paying for professional performances; the idea of collecting a fee for “plugs” was anathema. With the rise of broadcasting and ASCAP, performance royalties soon surpassed sheet music sales, and songs were being written for the professional, not the amateur. In the 1920s, the Tin Pan Alley era gave way to the days of the Great American Songbook. The best work of ASCAP founders Irving Berlin and Jerome Kern was still to come, and the rising second generation of ASCAP members included the Gershwins, Harold Arlen, Rodgers & Hart, and Cole Porter. There was a flipside to ASCAP’s success. By the 1930s, membership had become a practical necessity for anyone hoping to have music performed publicly and to collect a royalty for it. “For publishers and composers, to be outside of ASCAP was to be a nonentity in the music business.” ASCAP was able to enforce highly restrictive membership criteria that left entire genres—such as “race,” “hillbilly,” Latin, and gospel music—in the wilderness. And with its stranglehold on the mainstream popular music coming out of Broadway and Hollywood, there was little to restrain the pricing of ASCAP licenses. Although BMI’s early catalogue fell short of that promise, it cobbled together a sufficient number of songs by ASCAP-rejected writers and swing arrangements of public domain tunes to allow the radio networks to pull off a successful boycott of ASCAP music that lasted for most of 1941. BMI was firmly established, and in the post-war years its investment in niche genres began to pay off. “Race” and “hillbilly” music, with the backing of BMI, became the more respectable R&B and country, and when they merged into rock n’ roll, BMI was well-positioned to thrive. Virtually all the iconic early hits of the rock era came from publishing houses affiliated with BMI, and BMI music came to dominate the radio airwaves. By the 1950s it was the old ASCAP crowd petitioning Congress to break up BMI, charging that rock n’ roll was the product of a conspiracy to foist upon the American public music that broadcasters could procure more cheaply than the old ASCAP standards. In time the energy behind such futile efforts to put the genie of musical diversity back in the bottle was spent, and the memberships and repertoires of ASCAP and BMI became virtually indistinguishable, each reflecting the broad and widening spectrum of popular music. Music performance rights, virtually impossible to monetize before the advent of ASCAP 100 years ago, are an economic engine sustaining a beleaguered music industry today. Gary A. Rosen, the author of Unfair to Genius: The Strange and Litigious Career of Ira B. Arnstein, has practiced intellectual property law for more than 25 years. Before entering private practice, he served as a law clerk to federal appellate judge and award-winning legal historian A. Leon Higginbotham, Jr. He lives outside Philadelphia. The Library of Congress will exhibit “ASCAP: One Hundred Years and Beyond” beginning February 13th.